The Little Book of Feminist Saints, written by Julia Pierpont and illustrated by Manjit Thapp, gives brief introductions to and retells insightful anecdotes about key women in history. Many of the one hundred featured women are familiar including public figures such as Oprah and Michelle Obama, but others may be less so – people such as Kanna Sugako, ‘Matron Saint of Radicals’; Lucretia Mott, ‘Matron Saint of Suffrage’; and Ella Baker, ‘Matron Saint of Civil Rights’. 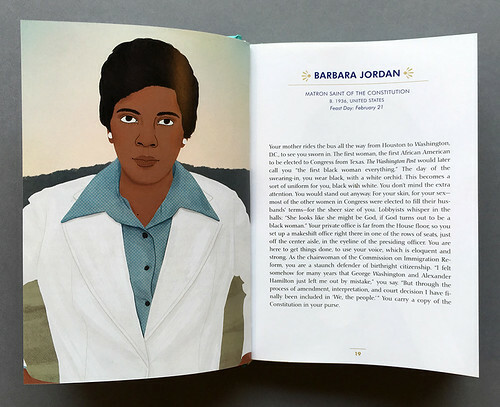 Spread from The Little Book of Feminist Saints showing an illustration of Barbara Jordan, ‘Matron Saint of the Constitution’, by Manjit Thapp. 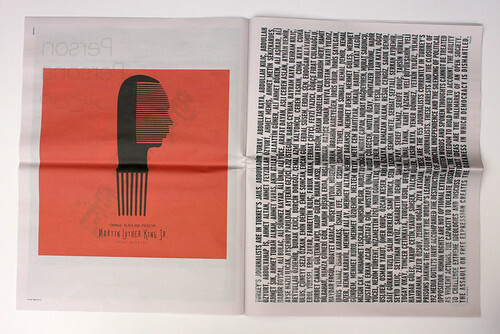 Top: Spread from Podium magazine showing contributions from illustrator Marion Deuchars and designer Erik Brandt. 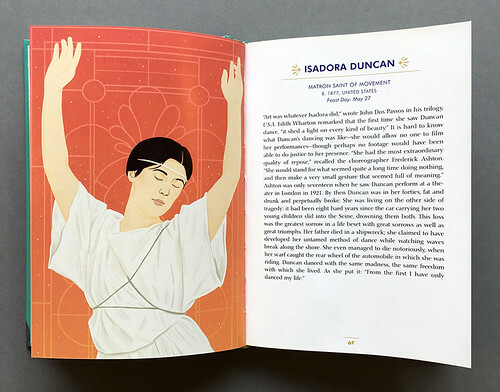 Isadora Duncan, ‘Matron Saint of Movement’. 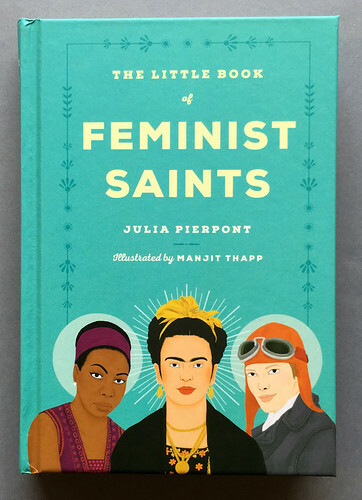 The Little Book of Feminist Saints, written by Julia Pierpont and illustrated by Manjit Thapp, Virago, £12.99. 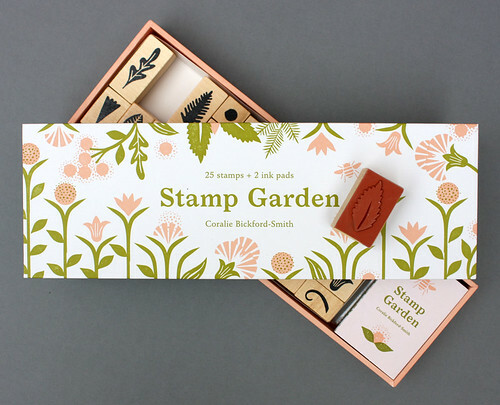 Coralie Bickford-Smith’s Stamp Garden (Princeton Architectural Press) is a box of two coloured ink pads and 25 stamps. The artwork (for the box and accompanying leaflet) shows the stamps in use. Bickford-Smith is best known as a cover designer at Penguin Books and the author of The Fox and The Star. Coralie Bickford-Smith’s Stamp Garden, Princeton Architectural Press, £19.99. 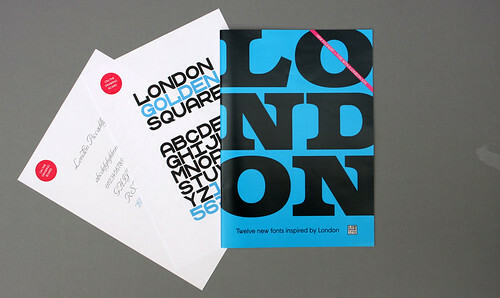 The London Type Foundry’s first type specimen book, features a dozen typefaces inspired by the capital itself. The new-ish foundry was formed by Paul Harpin, Paul Hickson and Joe Graham, who first came together to work on the BuyFontsSaveLives project in 2014. The collection includes London Belgravia Pro, Hoxton Half Square, CircleLine (an inline) and London Dingbats, by guest font designer Peter Grundy, aka Grundini, complete with a buggy, a brolly and a bowler. 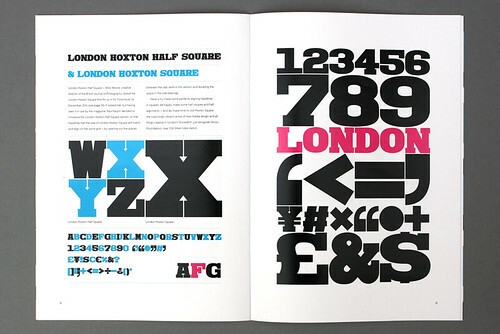 Cover and spread from London Type Foundry’s first type specimen book including two teasers for typefaces still ‘on the drawing board’: London Golden Square and London Piccadilly Script. Her Stories: An Art Appeal for Women, is a small publication that includes poetry by Amani Saeed and collage art by Marta Parszeniew. 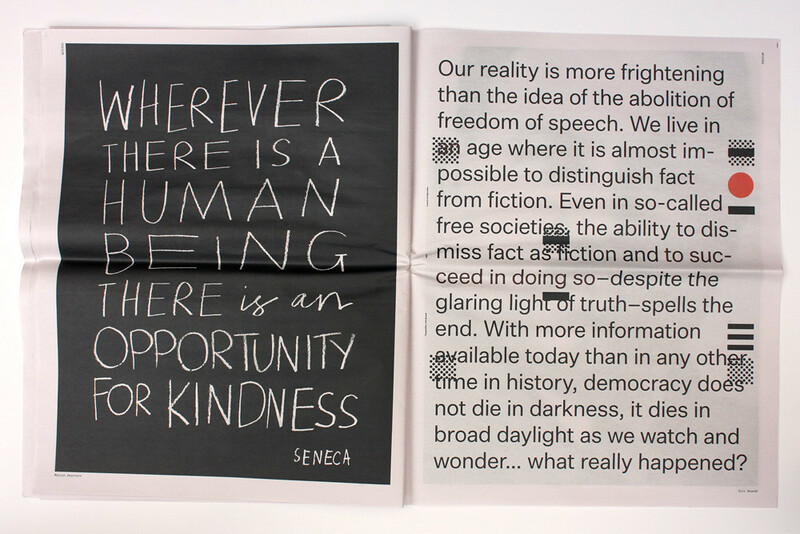 The zine, produced by the team behind Hotdog magazine was made to accompany an art auction at Protein Gallery. The event raised funds for charities that support vulnerable women in the UK: Beyond the Streets, Solace Women’s Aid and Young Women’s Trust. 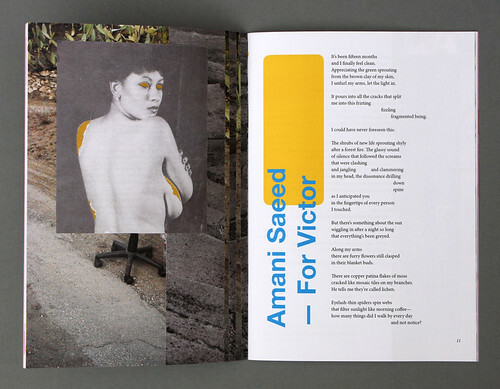 Spreads from Her Stories showing collages by artist Marta Parszeniew. 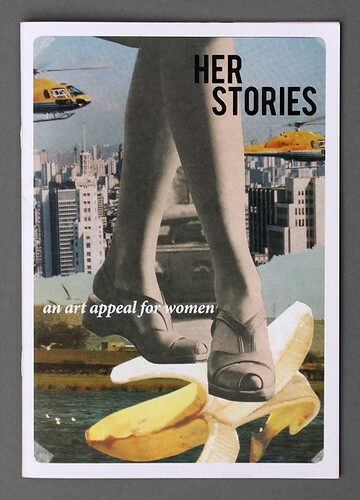 Her Stories: An Art Appeal for Women, designed and edited by Megan Conery and Molly Taylor, @hotdogmag. Issue one of Podium magazine – the product of the Collaborative or Die! elective at the Royal College of Art headed by Astrid Stavro and Adrian Shaughnessy – includes contributions from Majid Abbasi, Harry Pearce, Briar Levit and Flavia Nalon, among many others. 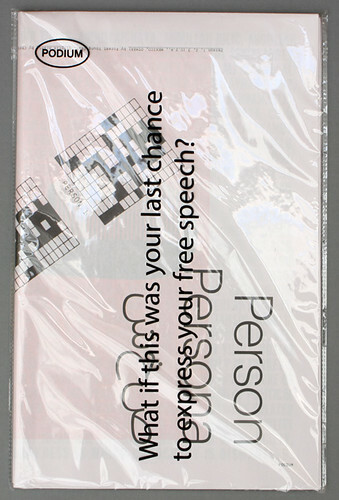 Each responded to the brief: ‘If this was your last chance of expressing freedom of speech: what would you want to say? and how?’. Podium was designed and published by the Collaborate or Die! team. 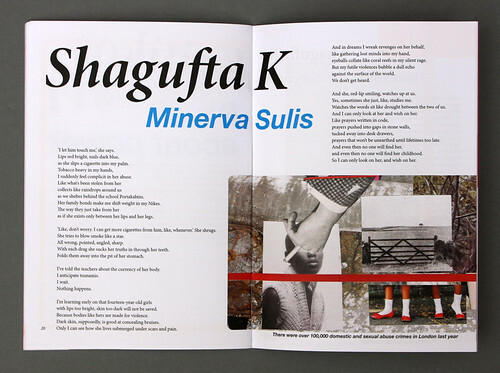 Spread from Podium showing contributions by Fred Martins (left) and Heval Okçuoğlu (right). Okçuoğlu’s piece reads: ‘Turkey’s journalists are in Turkey’s jails’ followed by a list of 155 imprisoned journalists. It continues: ‘These arrests and the closure of 192 media outlets have accompanied the destruction of judicial independence and the silencing of political opposition.’ Conceived by Okçuoğlu and Tobias Garnett. Design: Erkul Yazgan.